To our new followers, I say welcome. Hope you find my musings entertaining. Our RV is beginning to look like home. This past week, we have been busy moving things into our RV and painting inside the house so it can get listed before 10/31. 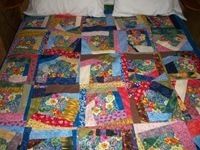 Carol has made several quilts and decided one of them needed to be on our RV bed. This is a crazy quilt named because the squares are made from a hodgepodge of fabrics, do not match and has no defined pattern. This crazy quilt is colorful and and defines who we are. We decided to move into the house is pretty empty. We have a king sized bed, two recliners, a folding table, boxes of stuff that will be sold in an estate sale mid November. The echo in the house was haunting so it was time to get moved. We do have electricity and water connected to the RV so that makes things comfy. My brother was here a couple of days ago to pick up a few things that he wanted. 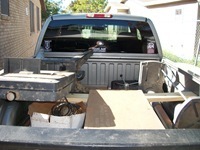 It was difficult to see him drive off with some of the tools from the wood shop. 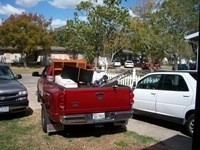 Additionally, we moved the last of the major items to my daughters apartment this afternoon. My grandson was given a couple of special things from me (Papa). 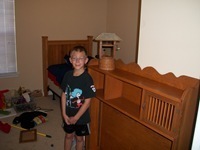 The bookcase in the photo is one that my Dad made for me when I was a little older than Gage is now. It is well worn now but I am sure my Dad would be please to know it has lasted over 50 years. The small wishing well was made for me by my grandfather about the same time I got the bookcase. He hand carved the stone work in the piece as well as hand cut the tiles for the roof. As Gage gets older, I am sure he will remember the origin of these pieces. I made the headboard you see in the background for Gage when he was 3 years old. In the background is a headboard I made for his first bed. He has woodworking craftsmanship in his room now that were made through 3 generations of our family. In addition to painting and moving, I also added to the list of mods for the RV. 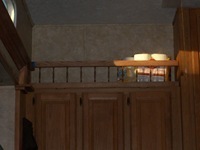 We have a tall space above the side cabinet in the kitchen. 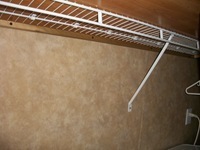 It is the perfect place to store things that are bulky.The railing would keep things in place as we travel. This replaced a small piece of crown molding that was more decorative than functional. The rail should hold things just fine. 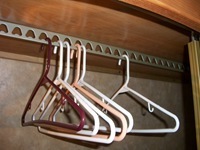 The closet in the RV had a useless cloths rod. We prefer a cloths rod that is more traditional to houses. so out with the old, and in with the new. On the left is the original, on the right is what we now have. With the lateral supports, the rod should hold just fine. 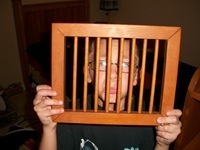 I thought I would close this with a goofy photo of my Gage. He was 4 when he and my daughter moved in with is three years ago. While I am happy for the new life we are all beginning, I am really going to miss him. I will certainly be looking forward to our visits. Hi Jerry and Carol! Looks like things are taking shape! The quilt is beautiful.